My almost three years at KU Law have been less than perfect, but I would not change my experience for anything. 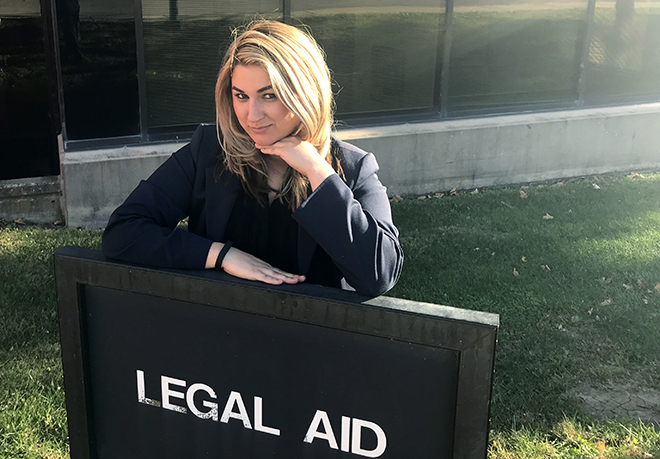 As my time in law school slowly comes to an end, I would like to discuss one of the best experiences I have had at KU Law: the Legal Aid Clinic. When I started law school, I was determined to be a corporate lawyer who never saw the inside of a courtroom. But during an internship I realized that was no longer true. I wanted to assist people in court. I wanted to appear in front of a judge and negotiate with prosecutors. Once I realized that, I applied for the Legal Aid Clinic. Lucky for me, Professors Melanie DeRousse and Meredith Shnug believed I would be a good legal intern. In the Clinic I have learned something that the rest of law school essentially does not teach you: how to be a lawyer. Along the way, I also discovered how to manage my anxiety, step out of my comfort zone and appreciate how important it is to work in a friendly and caring environment. The first time I had to appear in court, I was a nervous wreck. I arrived an hour before the hearing because I knew I would need to calm my nerves. Soon, the moment came for me to appear before the judge, and guess what? Nothing bad happened. Since then I have appeared in front of a judge at least a dozen times, and not once has anything gone wrong. I have survived each appearance and chipped away at my anxiety and fear. I have the Legal Aid Clinic to thank for that. Beyond gaining confidence in the courtroom, the Legal Aid Clinic has helped me step out of my comfort zone in other ways. In the past, I probably would have never considered trying to help change a local policy. But here I am, helping. The Clinic has started researching juvenile shackling with an eye toward figuring out what we can do about the issue. I never would have thought of tackling or pursuing a cause like that if it weren’t for the Legal Aid Clinic. Legal work can be stressful, but the lawyers at my internship last summer were friendly and helpful. They created a calming atmosphere that I feared would not be possible in the Legal Aid Clinic, with competitive law students as interns. That has not been the case. Working in the Legal Aid office is the best part of my week. Almost every time I walk in, I’m greeted with a smile and friendly “Good morning, Rayven” from Barb Wrigley, which starts my day off great. I have worked with two amazing supervising attorneys and some of the most inspiring law students in Green Hall. The Legal Aid Clinic has given me the opportunity to put on my lawyer suit, shed all my doubts about becoming an advocate and know that coming to law school was the right path for me. — Rayven Garcia is a 3L and KU Law Student Ambassador from Tucson, Arizona. 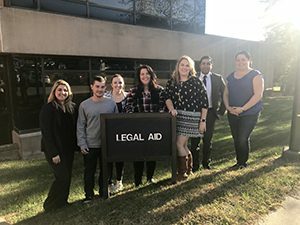 Legal problems have no regard for deadlines or convenience, and KU Law’s Legal Aid Clinic is ready to mobilize. It can assemble its army of student volunteers at a moment’s notice. As the Legal Aid Clinic celebrates its 50th anniversary, please consider donating to help the Clinic spring into action when the community needs it most. Gifts of any size will get us one step closer to our $5,000 goal!